A rug gripper or non-slip pad is a simple yet practical way to prevent falls. The fact remains that more than three million seniors end up in the emergency room each year because of these accidents. Luckily, there are many products on the market to help you remain safe while living in your own home as you age. Though sterile-looking, it provides adequate protection. The NYOrtho Bedside Floor Mat provides safe and secure footing for seniors and reduces the risk of falling for those at higher risk. The high density foam construction is 15% thicker than comparable mats on the market and protects against injury if a fall does occur with impact resistant cushioning. The The mat is 70” long, offering full body coverage for the user. The beveled edges are a welcome addition to allow you to use your walker or wheelchair right up to your bedside. It’s an excellent option for softening a blow if you wake up dizzy or lightheaded and can pull yourself up again. We liked the fact that you can choose between a foldable mat or the solid piece. Either way, it’s easy to store under your bed when not in use. It’s lightweight so that an older person can handle it. On the downside, it is more expensive, but we still consider it a worthwhile investment for what it offers in exchange. They are not suitable for rugs in high traffic areas. 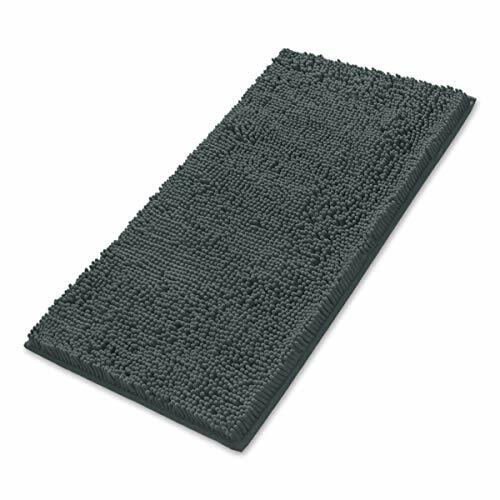 The rug gripper pad is an excellent value and will work as described. However, the strips may not stand up to heavy use when the grandkids visit or if you have dogs at home. Though expensive, it provides ample fall protection. 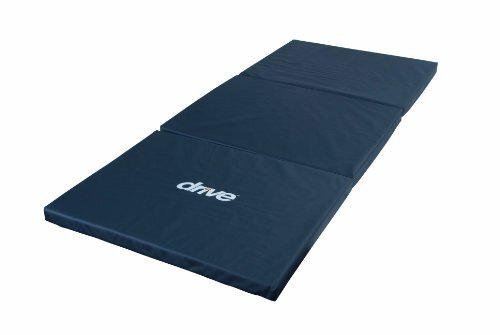 The Drive Medical Primemat 2.0 Impact Reduction Fall Mat is a great way for seniors aging in place to prevent bedside falls and protect against serious injury if a fall does occur. It is similar to the other fall mat we reviewed, but is a bit bigger and more attractive with its brown, leather-like appearance. It also has beveled edges to make it easier to maneuver wheelchairs or overbed tables around your bedside. It has a thick foam core and anti-slip netting underneath to prevent the mat from slipping. The mat is well-constructed and made to last. It is easy to clean and will hold up to everyday use. Our only gripe is the price, which is a bit higher than comparable products. Otherwise, it’s an excellent value that will give you the peace of mind that you deserve as you age. Its value lies in its ease of storage. The Drive Medical Tri-Fold Bedside Mat is an effective product for providing fall protection and prevention for seniors living at home. It conveniently folds into 3 sections when not needed so that you can easily store it. It is lightweight at only 3 pounds andits core is high-density foam, which gives ample cushioning to help you avoid injury. Unlike other items we reviewed, this one emphasizes convenience and portability rather than being a permanent fixture next to a bed. It lacks the beveled edges that we’ve seen in comparable products which limits its usefulness. Our take is that it’s a product to put out at night and store during the day. We also had concerns about the folds since those are places where it might be vulnerable to tears or possibly even become a tripping hazard for seniors with limited mobility or balance. The density of the foam is high quality , but it’s not an attractive mat to have out all the time. It provides reliable traction to keep your rug in place. 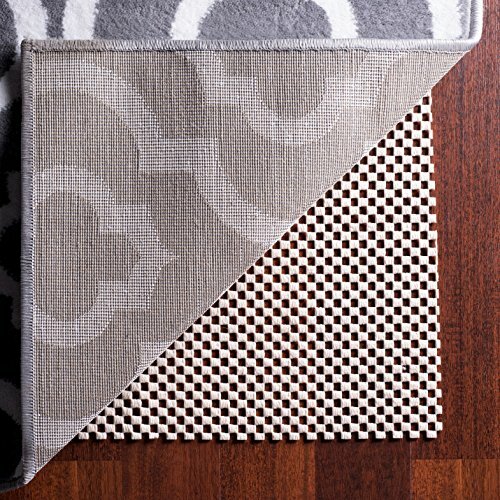 The Epica Super-Grip Non-Slip Area Rug is a non-slip pad that prevents rugs from slipping and provides extra cushioning, making it a perfect addition to the existing rugs a senior’s home. You’ll find a variety of pre-cut sizes to accommodate most standard rugs, but the pad can easily be cut down with scissors to fit rugs of any size and shape. It’ll hold your rug securely in place and it offers an advantage over rug grippers in that it covers the entire surface area. We loved the fact that your rug will stay put even if you vacuum over it. It’s washable and reversible too. The pad isn’t thick so it won’t create a falling hazard. The foam core absorbs the impact a fall well. The Secure SBFP-1G Bedside Mat is hefty than comparable products we reviewed and provides excellent fall protection due its thin, floor hugging profile. Its beveled edges make it ideal for seniors who use a wheelchair, are at high risk of falling due to imbalance, or have an overbed table near the bed. Both the top and bottom surfaces are slip-resistant to keep it in place and give you a secure walking area. It is an item that you’ll likely keep as a permanent feature at your bedside. The core is elastomeric foam which offers both adequate cushioning to protect you if a fall does occur and a soft surface on which to walk. You only have one color choice, reducing the versatility of this product.However, it performs as described which makes it an excellent value. The manufacturer backs the mat up with a warranty which we always appreciate. It has a soft, cushy surface that will protect your knees and back. 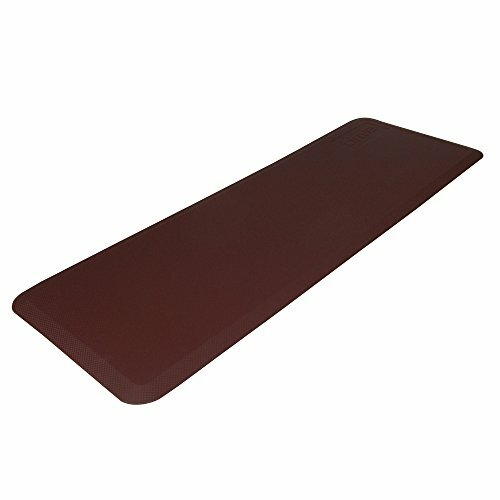 The Standing Logic Kitchen Mat includes gel-like memory foam to reduce pressure and foot pain whenever you stand for long periods of time. The cushioning absorbs the impact of hard surfaces that can lead to lower back pain, making it an excellent product for seniors who want to make their home comfortable and safe as they age. It has a textured surface for added grip. It only comes in black which will hide stains better if you use it in the kitchen. It has beveled edges so that you can use it if you have a walker or wheelchair without interfering with movement. The outstanding feature of this mat is the superior comfort it provides. However, it does not provide fall protection. It is affordable and a welcome addition to the bathroom. The Mayshine Non-Slip Bathroom Rug is a good-looking product that is ideal for preventing falls in the bathroom where they are the most common among seniors.. 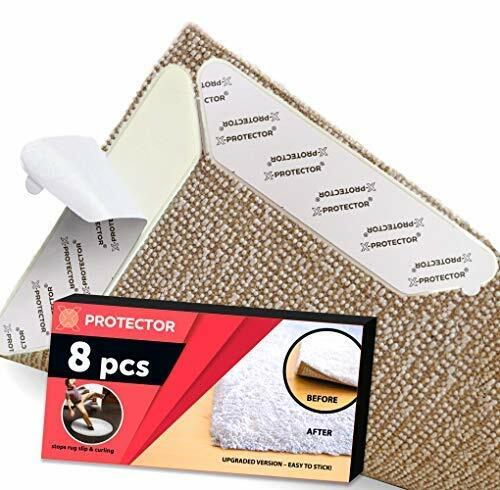 It has extra thick, dense fibers which provide a soft surface and the bottom is non-slip to make it more secure when you exit your bathtub or shower. It also absorbs a lot of water which can prevent a fall hazard from wet floors, making is an essential purchase for seniors seeking products that increase safety and peace of mind as they age at home. It is durable and can handle regular machine washing. We liked the fact that the color remained vibrant even after multiple times. It’s affordable too. We’ll discuss each one in detail with some tips along the way that can affect your purchase and your safe use of them in your home. You’ll typically see this feature highlighted in the product description if it’s not apparent when you view it. However, don’t let a descriptor like bathroom or kitchen sway you. These terms are merely marketing. You’ll likely find that many items will work well in other rooms in your home. Instead, focus on the practical things like how it holds up and whether it is water-resistant. Think about how you’ll use the product. One type of non-slip rug has a foam interior to take the pressure off of your back and hips if you stand for long periods of time. However, they’ll work just as well in an office or bathroom too. Consider how each one fits into your lifestyle and how you may benefit from it. You’ll likely find that non-slip pads are typically about three feet by two feet in size which makes sense given the average human stride falls within this distance. That suffices for getting out of bed or entering a home. And it’s those first steps that present the greatest risk for seniors, especially if you’re coming in from the outside where it’s raining or snowing. Keep in mind where you’re going to place it and consider that too. 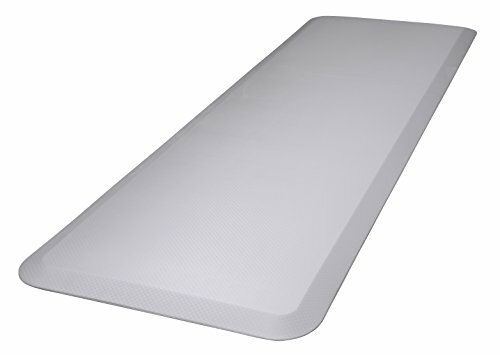 For example, if you’re an active sleeper, you may find it wiseto have a non-slip rug pad on both sides of your bed. Dimensions become more important when buying a rug gripper to make sure it provides ample traction to keep it in place. Both of these factors can play a significant role in your purchase. They can affect locomotion and your satisfaction with the product. Let’s talk about each one. If you are wheelchair-bound, the non-slip rug pad you choose mustn’t interfere with your ability to move around your home. It should allow you to glide around smoothly without any worries of it pulling up and creating an obstacle. You may find that pads that are thicker and stiffer in their construction, providing a better surface than something lighter. In addition to using these products, there are several other essential steps you can take to avoid an accidental fall, which will ultimately jeopardize your ability to live at home as you age. After all, throw rugs aren’t the only cause. Other things to watch out for include clutter lying in the hallways or other traffic areas. That precaution applies to the grandkids too. Make it a point to make sure they put everything away that they use when they visit. Also, consider other objects that might get in the way like ottomans, electrical cords, or other additions to your rooms. Push larger furniture back to allow for more open spaces to walk. If that means a new sofa, it probably is a wise investment in the long run. You might think about getting lighting installed to illuminate dark areas and staircases, as you may avoid a fall by merely being able to see what’s in front of you. Grab bars are another feature that can make it safer to get out of the bathtub or climb the stairs. You’ll find many attractive products that will fit in well with your decor. If you have throw rugs, consider their placement carefully, especially if there isn’t adequate lighting. And by all means, remove them if they prove to be a hazard. Remember that some falls have catastrophic consequences. Over 27,000 seniors die each year either as a direct result or because of its complications. Don’t risk it. A rug gripper or non-slip pad is a smart way to make your home safer and reduce your risk of a fall. As Most of these products are affordable, making them a wise choice in the long run. Fortunately, you have many options to find something that will work for your home environment. The objective is to consciencous about your environment, finding ways to ensure that your home accommodates your changing needs as you age. Taking steps to safeguard your home helps preserve your ability to live independently with a better quality of life.